We will text an answer if you text, we will call you if you leave voicemail. across the road from our farmstead. Rte. 1: I-75 to Exit 144. Head toward Frankenmuth on Dixie Hwy (about 3 miles). At Junction Rd turn left. 2.5 miles to Weiss Rd. Turn left. Maze is 1/2 mile on Weiss Rd. Rte. 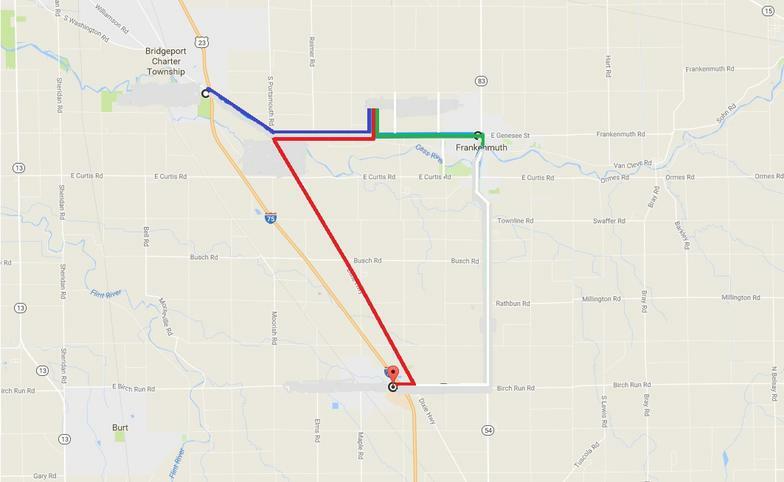 2: From city of Frankenmuth drive north on Main St. to Genesee St. (7-11 on corner).Turn west onto Genesee/Junction Rd. 2.5 miles to Weiss Rd. Turn right. Maze is 1/2 mile on Weiss Rd. Rte.3: I-75 to Exit 136. Turn right. At Dixie Hwy turn left and go about 6 miles to Junction Rd. Turn right. Go 2.5 miles on Junction to Weiss Rd. Turn Left. Maze is 1/2 mile on Weiss Rd. Farm fields do not have addresses. Our maze is across from our farmstead at 5450 Weiss Rd. On the east or right side of Weiss Road. or you will be directed to Weiss Street in Frankenmuth.